Introducing the New Grid Pad - Accessibility Services, Inc. The Grid Pad Go, Grid Pad Eye and Grid Pad Pro models have been replaced by the new 12” Grid Pad. 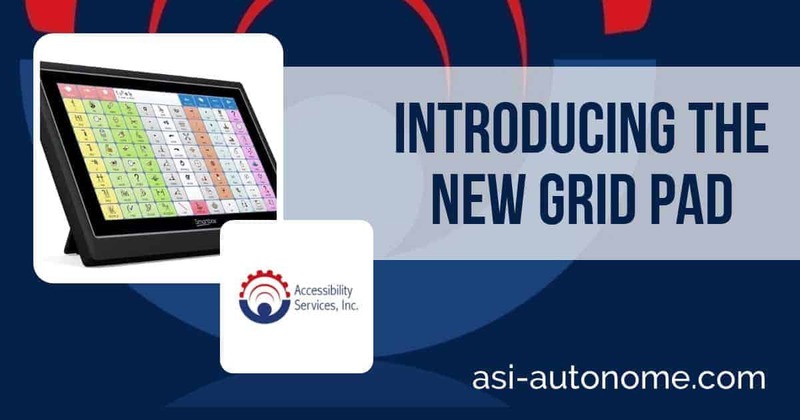 This next generation Grid Pad can accommodate anyone, including quadriplegics, with complex communication and access needs. The new Grid Pad features a rugged shell and has up to 15 hours of battery life. Perhaps most impressive is its multiple augmentative and alternative communication (AAC) access options, including touch, Eye Gaze, switch with two recessed ports and USB 2.0 and 3.0 ports that are compatible with joystick, trackball and Quha Zono head mouse. Powered by Grid 3 software and boasting the latest generation of Intel Core i5 processor and 8GB of RAM, the next generation Grid Pad is equipped with the Windows 10 Pro operating system. The 12.5” anti-glare hardened glass screen is another attractive feature of this unit. It also comes equipped with a remote power button and is keyguard ready. Oh, and let’s not forget the high-quality integrated speakers, stand, handle and mounting. Whether you are looking to upgrade your current Grid Pad or are a new user all together, Accessibility Services can help customize the right AAC solution for you.